Poker Cheating and Casino Cheating Blog: American Roulette: What about Poker Computers in Live Brick and Mortar Poker Rooms? What about Poker Computers in Live Brick and Mortar Poker Rooms? At a brick and mortar poker table? I am hearing about this online-poker cheating transformation to live brick and mortar poker games, which raises many new questions in the poker and poker-cheating world. First of all, the use of any electronic or digital gadget in a poker room is considered cheating, and may in some jurisdictions, especially Nevada, be prosecuted as a felony. But apart from the legal ramifications, do poker brick and mortar bots work well enough to give players using them a distinct advantage over their opponents at the table? The theory is that the poker computer, which of course has to be well disguised and avoid casino surveillance detection, can memorize all the exposed cards, calculate the cards remaining in the deck, and then feed that information to the user, who then decides how to play the hand. 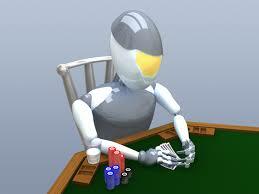 This is much the same function of poker bots being used to cheat online poker games. In a casino game like blackjack where there is no human element affecting the bets after they’re placed, computers can be very effective for card-counters and advantage players. The same holds true for roulette where computers can help determine biases in the spinning wheel and quadrants where the ball will land depending on speed and revolution. But poker, both online and off, is a game of intricate strategy and bluffing, in which skilled players constantly change their strategies to enhance their chances in any given set of conditions. That facet of the game is too hard to keep up with—even for computers. As far as I know, even the most sophisticated computers cannot latch on to players’ changing strategies and bluffing patters. So the bottom line here is until someone invents the ultimate poker computer that can read players’ minds, this is one type of artificial intelligence that can stay away from the poker tables.